Just over two years ago, I was writing about a particular rip-off being perpetrated by local authorities – this being the unlawful overcharge on Council Tax summonses and liability orders. At the time, I was estimating that my own local authority was overcharging by a factor of £4 million. But councils nationwide were estimated to have levied in the order of £230 million a year in summons and liability order charges. That rate, sustained for the twenty years Council Tax has been in force, put the cumulative cost at £4 billion, most of it representing an overcharge. Now fast forward to last April and the Blackmore Vale Magazine and we see a headline, "Court costs earn Councils £millions", with the sub-heading telling us that many millions of pounds may have been overcharged by Councils in the pursuit of Council Tax recovery since its introduction in 1992. Local Authorities, said the report, are charged a fraction of the amount passed on to residents in costs. Each Liability Order applied for costs councils £3 according to the Magistrates' Courts fee schedule. Struggling householders are then charged many multiples of this, for example, one London Borough Council imposes £125 costs for making late payments for Council Tax, but for Business rates, this increases to £220 for an identical process. Another Council in the South of England reveals in a document reviewing court costs that where previously it was necessary to seek approval from the Court to ensure costs being levied were reasonable, this was no longer required and "confirmed that it is for the Council to decide on an appropriate level". One authority in the North East admits costs are determined in-house. A Freedom of Information request uncovered a letter sent to the Magistrates' court advising that the "Council has taken the decision to increase the court costs which it charges to tax payers for the non payment of Council Tax". The same council revealed that it aimed to cover the entire budget for running its Council Tax department from court penalties, and with £0.88 million costs raised it had not made a bad attempt. This very council claimed its annual budget for all activity associated with recovery of Council Tax amounted to around £1.13 million. This compared with the cost of £1.04 million for council tax administration including staff costs, contact centre costs, enforcement, other running costs and central recharges. This is quite clearly illegal as the law only allows for "reasonable cost" incurred for the administration involved on processing the summonses and liability orders. With the statutory court fee, the cost for one household would be unlikely to exceed £5. However, councils are not only illegally using late payers to subsidise their tax collection operations, they are using the inflated changes as a "deterrent" element or to coerce payment. The same council documented that "the extra cost is seen as a way of encouraging prompt payment", and as a bonus would raise additional income of £38k a year. This is patently illegal. To conclude, the report finds that the Chartered Institute of Public Finance and Accountancy (CIPFA) identifies more than £179 million raised in summons and liability costs in 2010-11. Based on these figures and indexing inflation – since 1992 (the introduction of Council Tax) the best part of £3.5 billion may have been overcharged by councils in a bid illegally to cross-subsidise Council Tax collection. However, despite this huge sum – of what amounts to legalised theft – the national legacy media have been quite incapable of getting a "handle" on the story. And as for the Manchester media, it gets the story completely upside down. It calls this a "tax dodger" story, failing to recognise that nearly a quarter of GMC householders were ripped off to the tune of over £4 million last year. To compound the error, we have the Taxpayers' Alliance. Chief Executive, Matthew Sinclair, tells us: "Manchester can’t afford for so much Council Tax to be left unpaid, nor the cost of taking so many people to court". 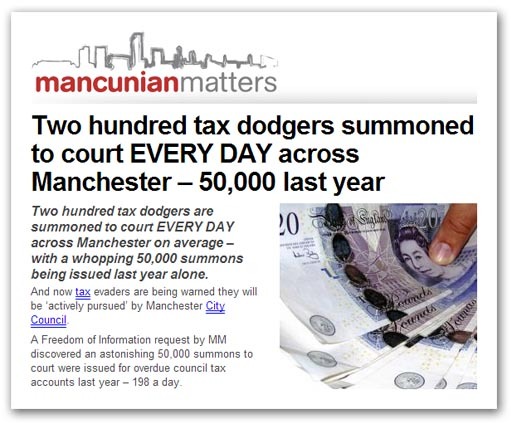 Totally oblivious is our Matthew to the fact that Manchester council is making a healthy and totally illegal profit from ripping off its taxpayers - the very thing the Taxpayers' Alliance is supposed to be opposing. When you have national campaign groups missing the point, and supporting illegal activity by local government, we clearly have a long way to go. Small wonder, North Jnr thinks the "tax dodging" has become both a moral and civic duty. He certainly isn't going to get any help from Matthew Sinclair.